There are different types of eczema. The most common type is atopic dermatitis (AD). AD is a chronic, pruritic, inflammatory skin condition that is associated with immune dysregulation and epidermal barrier dysfunction. The most obvious symptoms of AD are intense itching, along with red, dry skin that is sometimes scaly. The severity can range from mild to severe. It usually starts in early childhood. Most cases first develop in children under the age of 5 years. It is unusual to develop AD for the first time after the age of 20. At the moment, about 1 in 5 schoolchildren have some degree of AD. However, statistics show that it is becoming more common year on year in developed countries. There is no cure but treatment can usually control or ease symptoms, and treatment options are limited. About 2 in 3 children with AD grow out of it by their mid-teens. 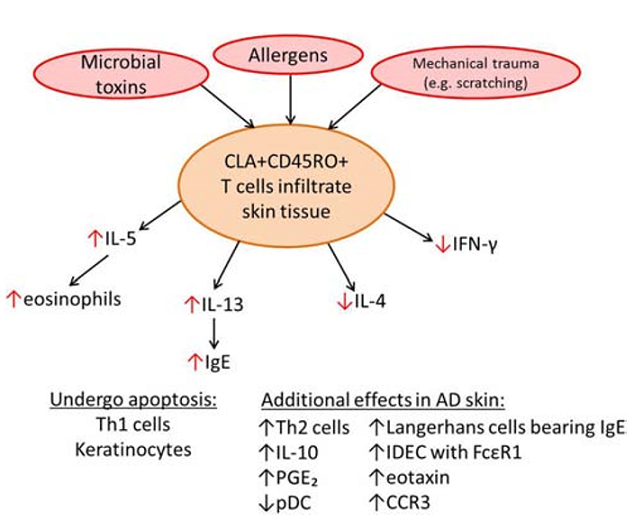 The specialized immune cells of the epidermis (Langerhans cells) in AD have an increased response to these antigens and interact with dermal T cells to produce a Th2 response. The inflammation induced by this Th2 response exacerbates the barrier defect. Also, some inflammatory cells release cytokines under the skin surface, which can cause some inflammation. The immune system develops in the first 6 months of life. There is a generally an equilibrium of the two main types of the T helper lymphocytes, Th1 and Th2. Patients with AD have poor immune cell function and a predominance of Th2-type cytokine response when their lymphocytes are activated. A Th2-type response, which is characterized by production of cytokines. In AD, various factors contribute to a high-Th2/low-Th1 cell environment. In the cutaneous inflammation associated with AD, not only activated T cells (Th2 and Th1), but also other inflammatory cells are known to be involved in a complex manner. In some children with AD, there are also high levels of IgE antibodies and eosinophils (the white blood cells associated with allergy). The imbalance of the Th2 and Th1 pathways and their associated cytokines in AD presents as one facet of the pathogenic mechanisms. In general, the treatment of the AD can be roughly categorized into treatment of existent cutaneous inflammation and prevention of new inflammation. It is important to achieve rapid remission of inflammation. Thus, the best remedy for AD is the use of natural topical immunomodulators with natural skin moisturizing and rejuvenating properties. Herbs, oils and minerals have been used in medicines and cosmetics from centuries. Their potential to treat different skin diseases, to adorn and improve the skin appearance is well-known. Herbal immunomodulators are also used when the immune system is over-active, as in allergies and auto-immunity. A revolutionary new AD treatment is a lipid-based topical immunomodulator (Atozym) aimed at modulating an immune system imbalance (Th2/Th1) and repairing the SC barrier function lost in AD. Atozym is a natural product. In clinical trials, Atozym has been used as monotherapy for moderate to severe AD in an intermittent fashion, so that treatment is started when the signs of inflammation such as a itch, dry and inflamed skin are present and flares occur. Atozym showed far superior efficacy to the topical corticosteroids. Moderate to severe AD usually needs long-term treatment. However, treatment with Atozym usually works very well to ease symptoms within a week. It also greatly reduces inflammation. Atozym has been shown to have powerful anti-inflammatory effects, among a number of actions. It also reduces tissue destruction during inflammatory reactions by a number of means. Atozym has been shown to improve skin barrier function and even to mitigate dermal or epidermal atrophy induced by corticosteroids. Atozym is the most effective topical therapy for diverse types of atopic dermatitis flares and severe recalcitrant AD. It can be used on dry lichenified lesions, and also work well to dry weeping or oozing (crusting) lesions. We have to stop thinking that chemical drugs can solve our problems. If you use Atozym, you will see the difference as the healing process starts to take over.